IceWave patches stimulate acupuncture points on the body for improving the flow of energy and produce health benefits free of drugs within minutes of use. When LifeWave™ IceWave patches are placed on an athletes' body over a specific region of injury, both localized and more generalized responses occur, offering an overall thermal response much like hot and cold packs. This is all done with no chemicals, creams or medication as nothing enters the body and LifeWave™ IceWave patches are non transdermal. IceWave patches are ideal for extreme sports including university, and college athletes. They provide minor relief for athletes with sore muscles, sprains, strains and other sports injuries due to intense exercise. The new IceWave patch from LifeWave™ is a unique nanotechnology product. The unique nature of the patches provides the body with an immediate thermal effect. As shown in the actual before and after pictures below, the reduction of "hot spots" is clearly evident. Local thermal effects include the restoration of temperature in an injured area to normal; reduced pain, and restoration of range of motion to the specific injured site. IceWave patches have been found in studies to have excellent results with minor muscle spasms and injury, and minor muscle spasms. 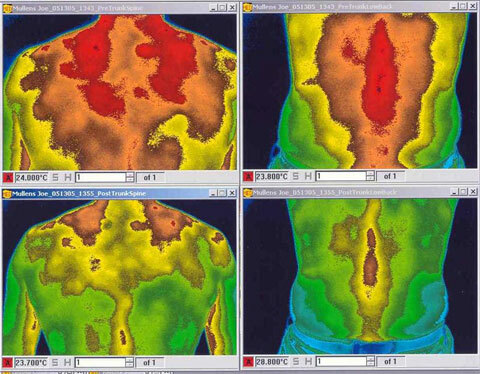 Infrared thermal imaging studies clearly show that LifeWave™ IceWave Thermal patches have both immediate local thermal effects on the skin as well as broader thermal effects that are mediated by autonomic nervous system control of blood vessel contraction and dilation. IceWave patches are not transdermal patches. IceWave patches are free of stimulants. It is known that specific frequencies of light can cause specific changes within the human body. When we go out in the sun, a frequency of light causes our body to make Vitamin D. Another frequency of light (UV) will cause our body to make melanin, the chemical that gives us a sun tan. Take a look at the actual before and after pictures below and notice how the reduction of "hot spots" is clearly evident. This local thermal effect means that excess heat is reduced to an injured area and what follows is reduced pain, reduced soreness, and restoration of range of motion to the specific injured site. All active ingredients in the patches are listed under the FDA database and are recognized as safe. IceWave patches are extremely powerful tools for the temporary relief of minor aches and pains. 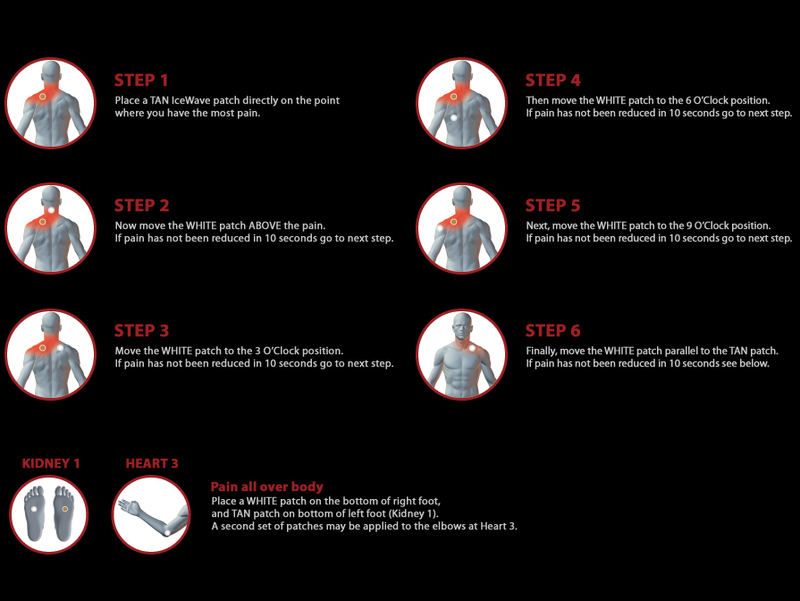 What has been found through extensive testing is that how you use the patches and where you place them will make all of the difference between how much pain relief an individual will experience with this product. Think of this as an electrical circuit. If we have a lamp and there is electricity flowing in the circuit then the lamp will light up; If there is no electricity then the lamp will not light. The Clock Method of placing IceWave patches was developed to provide fast and effective results for non-specific, localized pain. Start by locating the area with the most pain. Move through the steps below until the pain has been substantially reduced and/or mobility has increased. If you experience pain all over the body, use the Kidney 1 patch placement. Placement for the whole body relief can be achieved by using the Kidney and Heart meridians as stated above on the chart. This video is an introduction to the IceWave patches which are LifeWave patches designed to relieve pain. IceWave patches are designed to relieve pain. Most IceWave patches users experience up to 50% pain reduction within one minute after applying the patches. No chemicals are ingested in the body but rather a bioelectrical effect is induced to relieve localized pain. The negative tan patch is applied to the location of the pain. The white patch is then applied around the location of the tan patch following the "clock method" where the white patch is moved around the tan patch just like the arms move around a clock every 10 seconds until the pain subsides. 1.- How do the IceWave patches work if nothing enters the body? LifeWave™ IceWave patches communicate with the body through the human magnetic field. This is known as resonant energy transfer. They send the message, transport fat to the mitochondria and make ATP to the cells. This produces increased energy. 2.- Is this a transdermal patch? Does any herb or chemical go into the body? Nothing enters the body. LifeWave™ IceWave patch is not a transdermal patch. This is based on completely new science and is a new approach to energy and well-being. 3.- Are the IceWave patches safe to use? All materials in IceWave patches are listed by the FDA. LifeWave™ is manufactured at FDA registered facilities. The IceWave patches are in the FDA database. If you have a health condition or are in doubt please consult your doctor before using. 4.- Have the IceWave patches been clinically tested? Yes, IceWave patches have been tested in many clinical studies by some of the best researchers in the USA. These double blind placebo controlled studies prove the effectiveness of IceWave patches. Greater than 80% of people who have been evaluated and patched have received positive results. Approximately, 20 to 25% of the people received relief within a few minutes. 5.- What is the difference between the two patches, the white and the tan patch? Close proximity to the body heat can activate the IceWave patches and decrease the shelf life.